King Edward V of England was born on 2nd November 1470. He occupies a very sad place in British history in that he holds the record for the shortest reign of any recognised monarch, a mere 79 days between the death of his father and the day on which his uncle claimed the throne for himself. Edward was the elder son of King Edward IV and Queen Elizabeth who, as Elizabeth Woodville, a commoner and a widow, had married Edward on 1st May 1464. 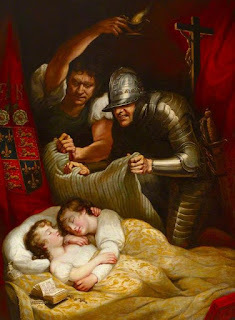 Young Edward was only 12 years old when the king died, and the role of Protector was taken by the Duke of Gloucester, the former king’s younger brother. The safest place for the new king and his 9-year-old brother Richard, Duke of York, was the Tower of London which, as well as being a prison, was also a royal palace. It was in any case normal for a new king to take up residence at the Tower to prepare for his Coronation. The princes were not thrown into a dungeon, as is often fondly imagined, but well looked after by the Constable of the Tower, who offered them accommodation in his own quarters. However, the expected Coronation never took place, because Uncle Richard had plans of his own. He knew that he was next in line to the throne after the princes, so if he could remove young Edward and his brother from the scene he would then be king. As it happened, there was a way of doing this, and that was to declare that both princes were illegitimate because their parents’ marriage was invalid. The claim was that Edward IV had been contracted to marry another woman, Lady Eleanor Butler, before his secret marriage to Elizabeth Woodville, and that this pre-contract (in effect a promise of marriage in return for sexual favours) was enough to invalidate the Woodville marriage. Richard arranged for an Act of Parliament to be passed, entitled “Titulus Regius” (The Title of the King) that legalised his seizure of the throne. The debate has raged ever since about the legitimacy of Richard’s claim to rule as King Richard III, and therefore whether King Edward V was rightfully deposed. However, what cannot be doubted is that the two princes were never seen again outside the Tower walls, despite later claims by “pretenders” that they were one of the two princes. It seems highly likely that Edward and young Richard were murdered, but when and on whose orders is also a matter for conjecture. All sorts of theories have been advanced as to who stood to gain most if the princes died, and Richard III is only one of several candidates. Nothing in the debate diminishes the fact that Edward V and his brother were entirely innocent victims of the machinations of others, and their fate was yet another example of just how dangerous it could be in those times to be born to certain parents at a certain time.